1.2 Value addition or illusion? 7.3 What are good manufacturing practices? 12.2 What is an NHP? 12.3 Current statistics on the NHPD regulatory products: what do the numbers show? 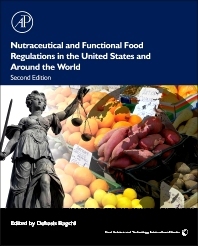 This fully revised and updated edition begins with insights into the scope, importance and continuing growth opportunities in the nutraceutical and functional food industries and explores the latest regulatory changes and their impacts. The book demonstrates the global scenario of the acceptance and demand for these products and explores the regulatory hurdles and claim substantiation of these foods and dietary supplements, as well as addressing the intricate aspects of manufacturing procedures. As the public gains confidence in the quality of these products based on sophisticated quality control, a broad spectrum of safety studies and GRAS, peer-reviewed publications and cutting-edge human clinical studies have emerged. An increasing number of additional populations around-the-world now recognize the efficacy and functions of nutraceuticals and functional foods as established by those scientific research studies. As a result, a number of structurally and functionally active novel nutraceuticals and several new functional beverages have been introduced into the marketplace around the world.